LAUNCHES THEIR 2014 WINTER RESORT COLLECTION. LVX nail lacquer announces the release of their 7th seasonal collection. Chicago (November 2013): Acclaimed for their one-coat high shine crème lacquers, LVX releases its first ever metallic and glitter collection for Winter Resort 2014. From stunning gemstones to textured glitters, LVX continues to astonish with their innovative seasonal palettes. The long lasting, chip resistant and non-streak formula is free of harsh and toxic chemicals. LVX products are VEGAN and formulated without the use of Formaldehyde, Formaldehyde Resin, DBP, Toluene, and Camphor. 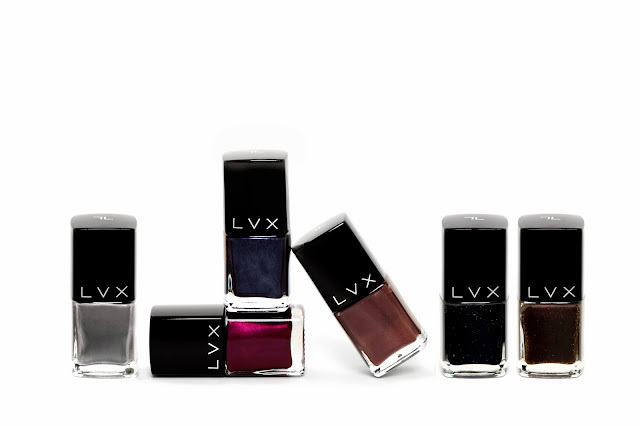 LVX is a no compromise nail lacquer that has superior formulation, is socially responsible and eco friendly. LVX nail lacquer is cruelty free. All products are produced in the U.S.A. The new collection will be available on November 27th on www.shoplvx.com.